MSV (International Engineering Fair) is held in Brno, Czech Republic and will take place from 14-18 September. With more than 1,500 exhibitors and 75,000 visitors from 59 countries, MSV is the leading industrial fair in Central Eastern Europe. The main focus of show is on mechanical, electrical and precision engineering and industrial machinery. During the MSV exhibition numerous workshops, seminars and conferences are held covering a wide range of subjects including export to specific countries, safety of industrial machinery and new trends within the manufacturing industry, making the exhibition not only an important meeting place but also a platform for learning and exchanging know-how. At MSV Russell Finex will showcase a range of their sieving and filtration equipment, including a vibratory sieve, liquid filter and gyratory sifter. 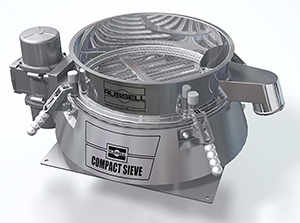 The Russell Compact Sieve® is a vibratory sieve designed to remove oversize contamination from powders or liquids. Key benefits of this machine are its low built height for easy installation in existing production lines, ease of cleaning and dismantling and a guaranteed high throughput and sieving accuracy. This machine can be retrofitted with a magnetic separator, ultrasonic sieving system, magnetic detectable gaskets and Russell Superclamps™. Watch an animation to see how this industrial vibratory sieve works. The Russell Eco Filter® is an industrial liquid filter with a self-cleaning design. This liquid filter has a reusable stainless steel filter element which is continuously cleaned by the wiper system. The Self-Cleaning Russell Eco Filter® can easily be installed in exisiting pipework within your production process to remove oversize contamination down to 10µm from liquids or slurries. Watch this animation to discover how these self-cleaning filters purify liquids and eliminate oversize contamination. The Russell Eco Separator® enables you to accurately grade wet or dry product in up to 5 fractions in one single operation. This round gyratory sifter is a cost effective solution and is available in six sizes: 24", 30", 40", 48", 60" and 72". Offered in both a painted and stainless steel base, the Russell Eco Separator® can be used in virtually every industry and in every production process. Watch the Russell Eco Separator® in operation in this demonstration video showing the dewatering of UPVC. Visit the Russell Finex Stand 2 at Pavilion G1 to learn more about their products and see how they can offer a solution for your separation requirements. At the stand an experienced sales team will be available to help you with your technical questions concerning sieving and filtration. In the meantime feel free to visit our industries page or watch our demonstration videos.